Thinking about fall and the cooler weather makes me think of soup. 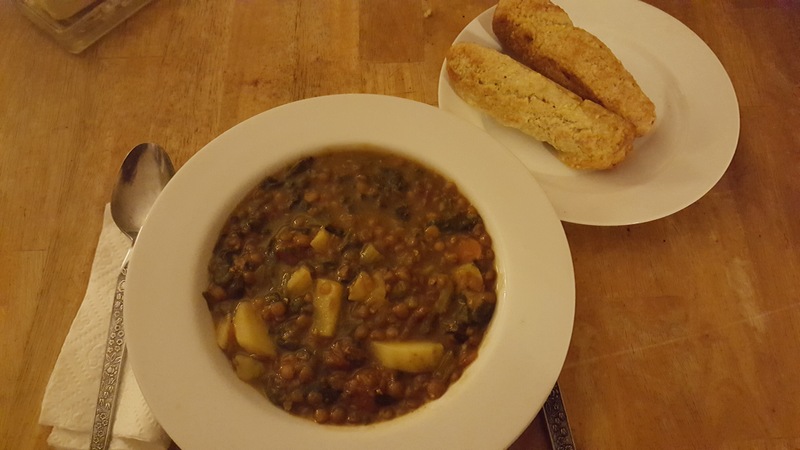 At the tearoom one of the first soups we made at the beginning of soup season was our vegan friendly Lentil Soup. Add onions then sauté till clear, stirring frequently about 7 to 10 minutes. Add carrots, celery and garlic. Sauté about 5 minutes till celery is translucent. Combine sautéd veggies with dried lentils, chopped tomatoes, salt, pepper, 3 quarts water and bay leaves. Bring to a boil, turn down heat to low, cover and simmer about 45 minutes or till lentils are tender. Keep an eye on soup as it is simmering and add more water if needed. Once lentils are tender, add chopped potatoes. Simmer till potatoes are tender about 15 minutes. Add frozen chopped spinach, simmer another 10 minutes. I like to serve this soup with corn muffins made with stone ground corn meal. I shared the recipe last month. Make a batch of this soup and freeze in small batches for a later date. Soup will keep for 3 months frozen.